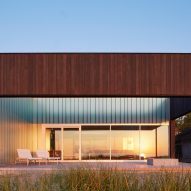 American firm John Ronan Architects has completed a square-shaped, waterfront home in Michigan that features a wooden exterior and rooms organised around open-air courtyards. 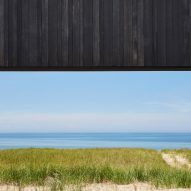 The Courtyard House sits on the sandy shores of Lake Michigan, within the quaint beach town of Saint Joseph. 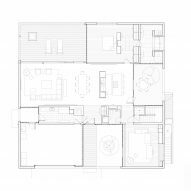 Square in plan and totalling 5,000 square feet (465 square metres), the home features a series of open-air courtyards that are designed to be in dialogue with interior rooms. 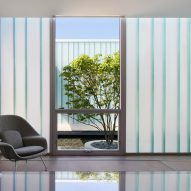 The outdoor terraces also frame views and ensure a level of privacy. 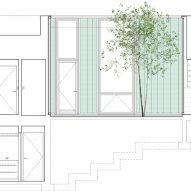 "This project explores spatial complexity through the studied arrangement of interior and exterior 'rooms' and their relationship with site," said John Ronan Architects, a Chicago-based studio founded in 1999. 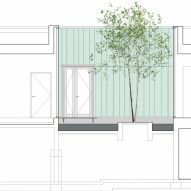 "Together, the four courtyards create private outdoor space and strategically screen views of the adjacent houses to preserve the feeling of isolation and privacy." A long driveway leads to the dwelling, which sits on a two-acre (0.8-hectare) site blanketed with grasses and dotted with trees. 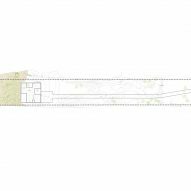 The front door is accessed via a bridge, which crosses over a reflecting pool punctuated with a small dogwood tree. 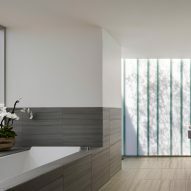 Visitors step into an entry vestibule, which leads into an open-plan dining and living area, where stretches of glass provide views of the water and a lighthouse. The public zone connects to a partially enclosed deck that overlooks the vast Lake Michigan, one of America's Great Lakes. Just off the kitchen is a dining courtyard, which "receives morning sunlight but is shaded from western sun in the late afternoon". In the northwestern corner of the home is the master suite and study, which are illuminated by soft natural light. 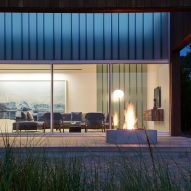 The home's palette of materials and colours was influenced by the surrounding landscape, including its sand, stone and driftwood. 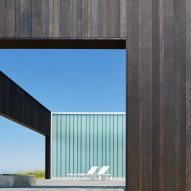 Charred Douglas fir was used for exterior walls, drawing references to the bonfires hosted along the beach. The burnt wood is also resistant to rot and insects. 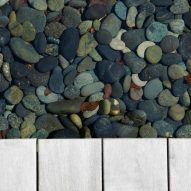 Textured, cast-glass planks – commonly referred to as channel glass – were used for certain portions of the facades, evoking the green beach glass that washes up on the shore. 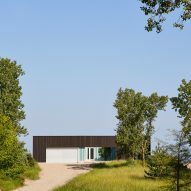 Other homes along Lake Michigan include a dwelling by William Kaven made of concrete, blackened timber and glass, and a slim beach cottage by Ramsey Jones Architects that is clad in Western red cedar. Photography is by Steve Hall at Hall + Merrick Photographers.